I was interested in reading The Hunt by Andrew Fukuda because of the premise. A human living among vampires? What a great idea. I wanted to know how a human could live undetected among powerful vampires. Gene has to follow so many rules every day to ensure he is never caught out at school. He’s not allowed to smile, laugh, sweat, sigh, cough, sneeze and so on as these are human characteristics. He wears fake fangs. He has to shave off all his body hair (except from his head). All this and more to hide in plain view of vampires. When he is chosen to participate in the Heper Hunt, Gene must try harder than ever to disguise his true identity from his opponents. Hepers (or humans) are scarce and to be given the chance to hunt some of the dwindling number is a great privilege to vampires. Gene knows that partaking in the Hunt will reveal his true identity, putting him at peril. As he learns more about the hepers however, his view of them drastically changes. Will he really let them be hunted? With the help of one of his opponents; Ashley June, Gene decides his own fate and that of humanity’s. I read The Hunt because I enjoy dystopian stories. Everyone loves stories where the odds (and the whole of society) are against the hero and where the hero must fight to overcome these. 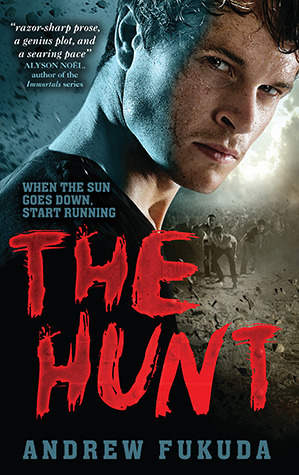 However, while the premise interested me enough to read The Hunt, it didn’t meet my expectations. I had a lot of questions that weren’t answered like how the world had come to this point, why Gene and his father hadn’t tried to run away rather than living in danger, how Gene could possibly suppress involuntary actions like sneezing and hiccupping and how the vampires couldn’t detect humans in such close proximity. I couldn’t connect with Gene because he made too many bad decisions in the story, particularly at the end. I never got a true sense of who he was and what he wanted; he was under such an intense disguise that perhaps he didn’t even know himself. I wanted to know so much more about other characters such as Ashley June, the other opponents (who are only given nicknames) and the hepers. They were quite sketchy characters that needed more development for me to understand their motivations for their choices. Furthermore, the prize that the winner of the Hunt would get was a big letdown. The Hunt did have some redeemable qualities. There is a great chase scene and some pretty gory descriptions; however it was not enough to allow me to enjoy The Hunt. While some may enjoy how action-driven The Hunt is, for me there were too many questions left unanswered. Very interesting review, Kulsuma. I am intrigued!